I’ve made quite a few wreaths over the past year but this is the first time that I tried out deco mesh. 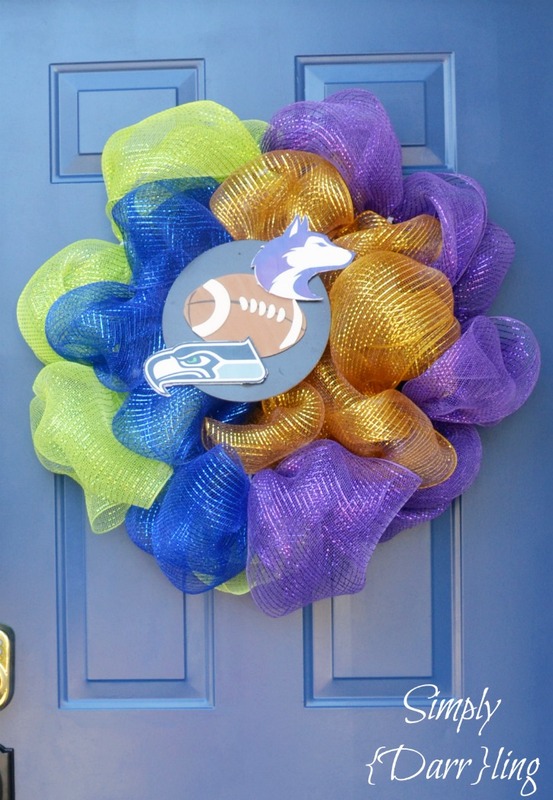 Football is just starting so now is the perfect time to make a wreath to commemorate. 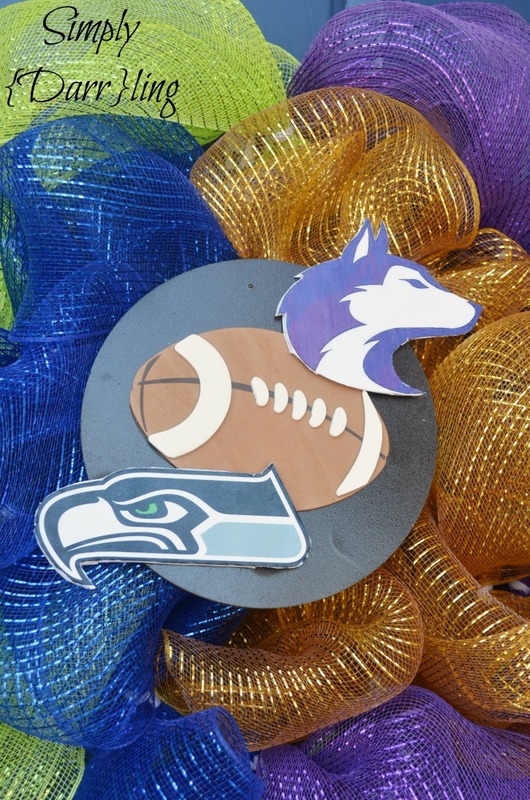 I couldn’t decide between Seahawks or University of Washington Huskies so I decided to do a split wreath. 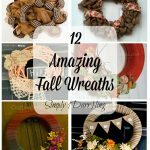 This wreath was pretty easy to do and turned out amazing! 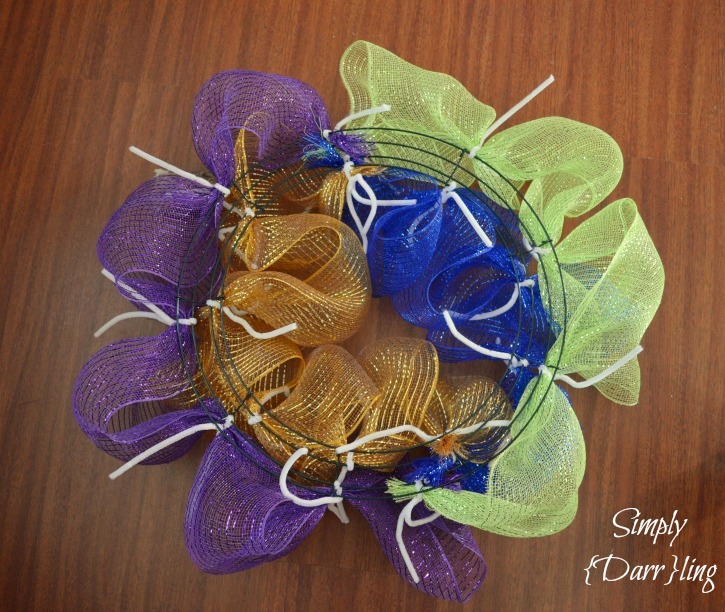 The wire wreath form has 4 wires that are divided into sections. Tie two pipe cleaners into each section on either the top/bottom wire or the middle two wires. The flat side will be the bottom so make sure that the ends of the pipe cleaners point towards the curved end. Gather the end of one of the rolls of deco mesh and tie it to one of the outside pipecleaners. Move up about 12″ and tie that to the next outside pipecleaner. Repeat all the way around the wreath (since mine was split between two separate color schemes I stopped half way through and started the second color). Switch to the second color and do the same on the lower set of wires. After I looked at my wreath from a distance I decided that it needed a bit more so I went all the way around with a second level of mesh. This definitely helped fill out the wreath. 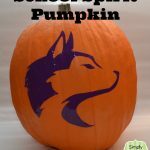 I wanted to put something in the middle which made it clear that this wreath was supposed to represent the Seattle Seahawks and University of Washington Huskies. I found a 10″ unfinished wood circle and painted it with Oil Rubbed Bronze (Its what I had and it looked nice). The wooden football was also a find from the craft store. I wanted to put the logos onto the wreath somehow as well, in order to do this, I printed them onto some paper, cut them out and then glued that onto some foam board. Using an X-ACTO knife, I cut out the logos and glued them, along with the football, onto the circle. The logo portion of the wreath is attached to the actual wreath with fishing wire so that it looks like it is floating in the middle. 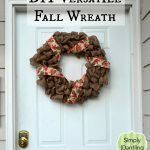 This wreath is a great addition to the front door and will definitely be up there for a while (at least until I decide it is time to switch to my fall one). 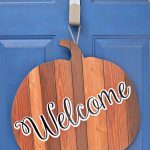 Do you decorate your front door? What sort of things do you decorate with?